When Lou Clark loses her job in a cafe she ends up working for Wil Traynor a quadriplegic and this is the story of how the experience changed her outlook on life. Describing this book is difficult as the subject matter sounds grim, but the writing and the humour, particularly between the lead characters, lifts the story and makes this a truly memorable read. That said there are some sad parts and I certainly had a lump in my throat more than once. 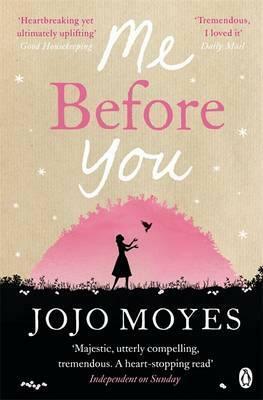 I chose this book having read Jojo Moyes latest book The Girl You Left Behind which was also brilliant. I really enjoyed this book, Jojo Moyes has a real flair for writing with great characterisation including the minor characters. As well as the central tale there are themes of family relationships, education and living life to the full potential. A perfect book in every respect.